Few travelers think about traveling to Moscow in the winter, but while sub-zero temperatures and a covering of snow mean that you’ll have to pack smart and bundle up well, a visit to Russia’s capital city during the months of December, January, or February will offer unique cultural experiences. Winter affords visitors the opportunity to see Russia as it’s often portrayed: a bitterly cold, exotic land of fur hats, onion-domed buildings capped in frost, and hearty foods and beverages developed to stave off the winter chill. Moscow’s winter weather is cold. This cold is usually accompanied by ice and snow that may be generously dropped on the city by winter storms, which may also cause flights to be delayed or canceled. Because mid-season warm spells don’t occur as often as they do in other parts of Europe or the U.S., ice, in the form of long dangerous icicles, grows thick and heavy on roof overhangs. A few deaths from falling icicles happen every year in Russia, so it’s important to be aware of how severe the winter weather actually is. Packing for winter weather can be difficult—winter clothing is more bulky, heavier, and more expensive than summer clothing. When you pack for travel to Moscow in winter, think about what you would pack if you were going to go skiing. You’ll need accessories to cover your extremities, footwear that provides tread and insulates both the soles and the upper part of your foot and leg, and a jacket that breaks the wind and provides protection against the low temperatures of Russia in December, January, and February. A coat that falls below the hip is recommended. Remember that you’ll be out in the weather more than you would be at home, where it may be convenient to go from house to car without being exposed to the elements for too long. When you travel, you’ll do more walking because you’ll likely be taking public transportation and seeing sights along the way. Moscow’s winter events lineup includes seasonal and cultural events travelers can’t experience any other time of year. New Year’s Eve in Moscow is one of the biggest events of the year. Though some people head to Red Square to await the fireworks display, others opt for ringing in the holiday while attending private parties or events. The bitterly cold nights in Moscow, as well as the inability to easily remove yourself from the festivities on the square to get to restrooms, can make standing around for hours uncomfortable to those unaccustomed to Russian winters. The Russian Winter Festival is a celebration of winter that makes the best of the short, dark days and frigid temperatures. Elegant and whimsical ice sculptures begin to appear and snow art and games contests are held. Christmas in Russia falls on January 7, and the time between New Year’s Eve and Christmas Day is a day of relaxation in Moscow. Most families focus on spending quality time together and eating traditional foods of the season, and some leave the city altogether, taking advantage of days off work to visit warmer locales. While certain service-oriented businesses, such as restaurants, may remain open, other businesses may close their doors or shorten their hours during the weeklong-plus period of vacation. Maslenitsa is Russia’s farewell-to-winter festival, and it occurs in February or March. This pagan celebration is marked by games, contests, and Russian cultural traditions. It’s held in the Red Square area every year and draws crowds of Muscovites and visitors. Other Moscow winter activities include ice skating, enjoying snowman “parades” where thousands of snowmen crowd walkways and thoroughfares and taking an icebreaker cruise. 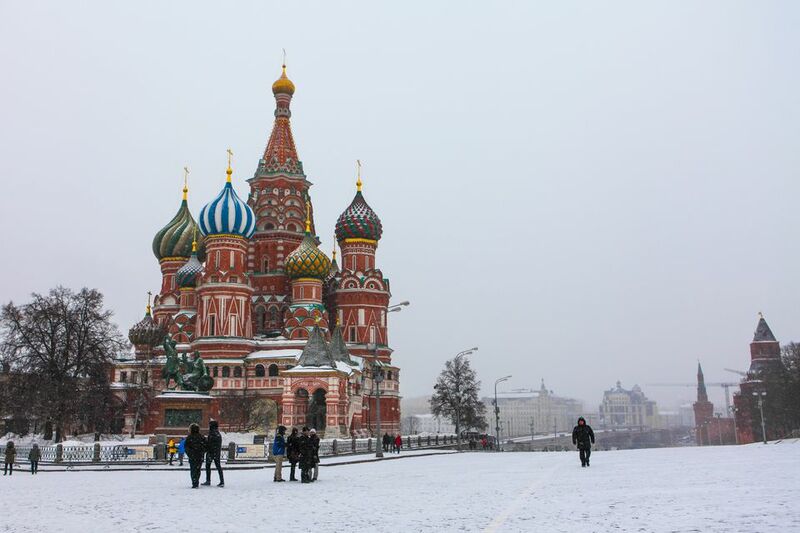 Another recommended activity for the cold weather is a Moscow museum visit. You can easily spend hours in museums such as the Tretyakov Gallery, the State Armory Museum, or the Pushkin Museum of Fine Arts. Why Is Moscow, Capital of Russia, Called the City of Domes?